Walking down the long row of trailers, I wonder how I will recognize the one that belongs to Daniel Wallace and Judith May. They all look the same. As I near it, though, the ownership of the mobile home is made obvious by a preponderance of what their makers refer to as wobblies, wooden creatures, each with a name and a story. I should have known there would be something. May greets me at the door of the trailer. She is standing next to a wooden pig painted to resemble Uncle Sam, with a sign on its chest that reads “Make Love, Not Bacon”. May is tiny with a large toothy smile, and is wearing an apron. Her comfortable grandmotherly persona belies a penchant for Harley-Davidson motorcycles and the men who ride them – most notably the man in her life, Daniel Wallace. Wallace himself is waiting inside at the kitchen, an album in front of him. The album contains pictures of and clippings about his various projects. He is looking at the pictures in the album as though they were photos of his grandchildren. The trailer around him is huge, almost the size of my house. On the wall above the drivers seat I notice an assembled 600-piece puzzle, a picture of a house in a snowstorm, which has been laminated and framed. Wallace resembles May in his grandparental nature, short and grey and all smiles. May describes him as “like a little elf”, and there is something about the two of them that does remind me of the old cartoon, ‘David the Gnome’. I find myself in a reverie in which I imagine Wallace in a pointy cap riding on a fox named Swift. Have you seen the wishing arch? It’s in the land of OB. 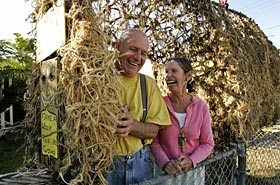 And if you hear the call of the twine, you can make a wish and it won’t cost a dime,” he sings the first verse of a song that is very similar to a children’s nursery rhyme. 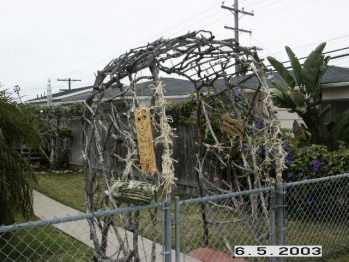 ‘The call of the twine’ refers to the bowl of twine next to the Wishing Arch, kept full by the good grace of OB Hardware and a sneaky septuagenarian named Gloria (Gloria used to steal the twine and braid it – Wallace caught up with her before he moved and asked for her to take charge of filling the bowl, since she was coming by every day anyway. Miraculously, this worked, and now Gloria is the official Keeper of the Twine). Each piece of twine is a wish. Since its creation in 2003, Ocean Beach locals and visitors have been tying twine on the arch and making wishes. Located at the gate of their former home on Ebers (between Niagara and Newport), the wishing arch looks from a distance like a shaggy beast, maybe a cross between Cousin It and a water buffalo. 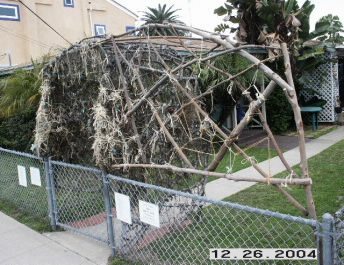 Close up, it proves to be an arch, with a long side extension, completely covered with tied pieces of twine. Thousands and thousands of pieces of twine. This shaggy beast is a creation of wishes, an inspirer of dreams. “Throughout the years, I’ve had people call me and thank me,” Wallace says, “the people who make wishes for things you can’t buy, you know, happiness, mending a relationship, finding a relationship, whatever, they get their wishes.” Wallace tells the story of a woman whose mother had been very sick. The doctors were trying everything they could think of and nothing was working. The woman started making wishes that her mother get well, and sure enough, she did. Another story is of a man whose erstwhile surfing buddy had stolen his truck, surfboard, and all the cash in the house after a night of drinking. The man complained to his son, and, for lack of any better leads, his son took him to the arch and they made some wishes. Nine days later, they got a phone call from Mexico – the truck had been spotted! The man ended up getting the truck, board, and most of his cash back, sort of an unprecedented stroke of good luck. “Good things come about when you wish,” says Wallace simply. May smiles at her ‘little elf’, intimating to me that the donation is a not uncommon gesture for Wallace. When the couple first met, at a Harley-Davidson party in LA, Wallace approached May with a fishing pole and a bucket of treats, asking her to go fish. She’s been watching him give, and helping him create things to give, ever since. Besides the arches, Wallace and May have also created dozens of little wooden creatures called wobblies. The patriotic pig outside the house was one of the few wobblies to stay with Wallace and May when they moved out of Ocean Beach house and into a home they could travel in. May walks me back out to be formerly introduced to the wooden pig, whose name is Porky, and his pals, Sheila the cat, Fetch the sheep-dog, and two creatures that May calls ‘OB Surf Pods’. The wobblies were, at one time, an integral part of Wonder-full-land. Besides the few that now live at the trailer, they have all been given away or sold at a yard sale. They seem almost like pets, and I wonder aloud whether Wallace and May miss them, along with Wonder-full-land. “It was hard to leave,” Wallace agrees, looking at May for confirmation, “but we pleased so many people.” The yard sale, he explains, was held right after a spate of fires. Some of the people attending had had their homes burned out. There was one woman, Wallace says, who bought almost all of the tall wobblies to give to people, just so they could have something in their yard. May nods. She has been with Wallace since around 1993, after her divorce (neither can recall the exact year they got together – their whole concept of time seems a little hazy, actually. Wallace makes a joke about being seniors), but the two seem like high-school sweethearts, like those couples that look like two fruits plucked from the same tree. They finish each other’s thoughts, and they each get teary-eyed at separate parts of the interview, talking about their life together. A relationship cynic might think twice after meeting them. Together, they seem to be living proof of Wallace’s claim that he has no wishes but to see others’ wishes granted – that everything he’s ever wanted has come to him. The conversation begins to wrap up, and we return to the topic of the Wishing Arch. Wallace can’t think of any real motive for building the arch, no burning desire for anything in particular, just something to do with the recycled wood he was picking up on the side of the road and at dumpsters. He tries to think of what drove him to build it, and his answer comes slowly but confidently: “It’s something that I just thought was right, and it felt good. There was no, like, give me money and you can have this. It was unearthly. In most cases, you don’t find somebody helping thousands of people without asking for something for it. And that made me feel good. There’s a strength and a power, there’s an energy here.” We say goodbye and part ways. I get on my scooter for the ride back down to OB, the home of Wonder-full-land, the Wishing Arch, and the ghosts of the wobblies. I don’t have a piece of twine, or an arch, but I do have a ‘wish stick’, a painted piece of wood left over from the building of an arch, a gift from Wallace. So I make a wish. ED: Thanks to Daniel and Judith for sending the photos! What a delightful interview! What vivid descriptions! I particularly liked the line “like those couples that look like two fruits plucked from the same tree”. You don’t get to read about many individuals that are so unique. I like that Ocean Beach attracts people of this nature. Good interview. Thanks Mary. I love stories like this. I have left quite a few wishes on that arch over the years. But I’ve never seen anyone out there. 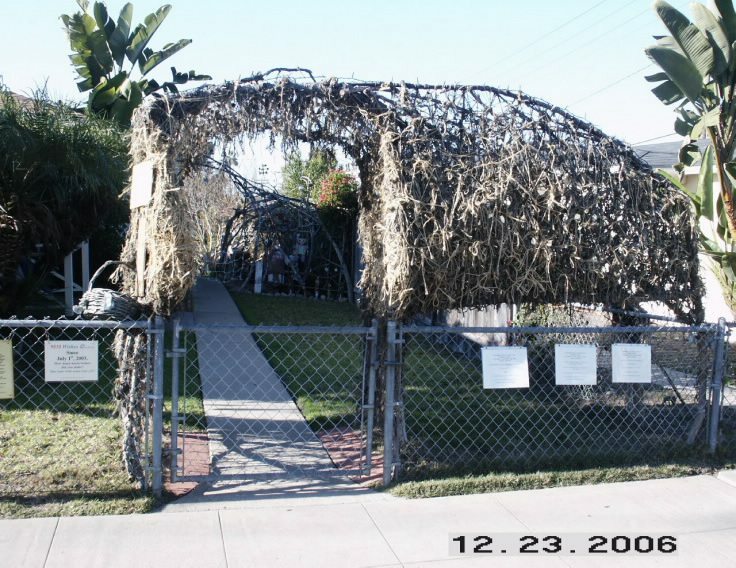 Nice to know the story behind the wishing-twine-arch-thingy. Thank you Mary! methinks that we may see more wishing arches popping up all over OB after the vivid and wonderful descriptions in this article. I had always wondered about that Wishing Arch on Ebers St. and the beautiful souls that must have been behind it. Thanks Mary for bringing Daniel Wallace and Judith May and their best wishes for everyone to light. I believe that a wish is like a prayer and when you put positive energy into the universe, you get positive back. Very cool piece! Not much I can say about how well your writing flows that hasn’t been said, so I’ll say ditto to all the other compliments and congrats! My husband and I remember how delicious it was to visit Wonder-ful-land and the wobblies. We have one (her name is Lupita) and she goes “cha-cha-cha.” She has adoption papers and all. Sometimes, when I feel blue, Lupita dances in my imagination and I smile. These two people are so rare in today’s world. We were so sad when they left OB. It was like a huge hole replaced all the joy. Thank goodness the arch is still there. We always tie the twine when life gets in the way of our happiness and we need a place to make a wish. Daniel calls us PB for Pat and Benni and always said it was nice to have a little PB in OB. I am delighted to read this tribute to my friends. Judith has been in my life for almost 12 years, and I have made my wishes with the twine. My dreams come true, too, and I am glad that my energy lingers in OB! One fo her whimiscal art piesces graces my home and makes me smile! I made a wish when I was there in 2003 and believe me it did come true. I have never been so much at peace as I was when I was there with you two and the wobblies and critters. Thanks guys.